Down the street is our neighborhood’s giving tree. Cherry oatcake is a hormonal win any day. she’s our gathering place. By spring, she smells of flowers. And every single summer, she bears loads of sweet and tart cherries. This year was no exception. We lucked out with a “bumper crop”. Her branches were literally loaded with beautiful, red cherries. on sweets and even limit their fruits to one piece a day. your pancreas into a tailspin and kick your adrenals into overdrive. decreases thyroid function and TSH production. about cherries in the heat of the summer sun? with these four steps to minimize a blood sugar conundrum. 1. Soak grains in yogurt. Soaking grains helps to breakdown any anti-nutrients and hard-to-digest parts of the grain. Soaking may seem time consuming at first glance, but it’s really more about thinking ahead. And soaking grains has another hormonal benefit. Often, low thyroid equals poor digestion. When grains are easier to digest, there’s a lot less drag on your thyroid. 2. 50-50 steel cut oats and rolled oats. Steel cut oats are less processed than rolled oats, and both are less processed than quick oats. With more of it’s natural juju intact, steel cut oats won’t sway blood sugar like the others. You can up your hormonal mastery here and play with the percentage of steel cut vs. rolled oats in this recipe. I ended up going 50/50 but I bet 75/25 (favoring steel cut oats) would work well too. of the fruit and the tiny bit of honey. but those sweet flavors are best when tempered with proper ratios of fat and protein. 4. It's made in a pan. Maybe the best part of this special Cherry Oatcake is that it’s made in a pan. your kids or enjoy for yourself that hits the spot without throwing you into a blood sugar tizzy. 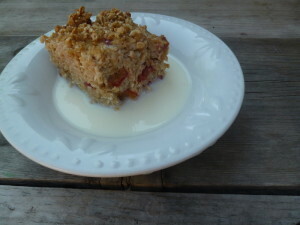 So without further adieu, here she is, my special Cherry Oatcake recipe. Check it out and tell me what you think of my sweet-and-sour snack in the comment section. As always, I love hearing from you. Older PostSupplements: Could They Be Harming your Health?